Former Kakamega Senator Boni Khalwale has cast doubt on the slated January 30 swearing in of National Super Alliance (NASA) leader Raila Odinga and his deputy Kalonzo Musyoka. Through a tweet he posted on online, Khalwale has cautioned that the swearing in ceremony is increasingly becoming a joke and it’s only a matter of time before Kenyans start taking NASA leaders for a joke. The famous “bull fighter” was reacting to a mock swearing in event conducted by some leaders from Western Kenya when Raila held a rally in Kakamega County over the past weekend. “I personally believed that swearing in Raila Odinga was a serious, formal & dignified solemn national issue, complete with constitutional & legal protocol. Now with these senators purporting to conduct the exercise in Kakamega, Kenyans must be forgiven if they take us for jokers.” Read Khalwale’s tweet. The former senator said he hoped that the ceremony would be held in accordance with the law of the land and in a dignified manner. His feelings come moments after Kitutu Chache South MP Richard Onyonka, elected on a Ford Kenya ticket, said he only recognizes Uhuru Kenyatta as the president of Kenya. Onyonka said NASA can go on with their planned swearing in ceremony but that won’t change the fact that Uhuru is the leader of the country. NASA announced that its plans to swear in Mr. Odinga are on top gear and the ceremony will be held towards the end of January. Nevertheless, the government through the Attorney General Githu Muigai has warned that such a move will amount to high treason which is punishable by death. Gunfire in a quaint Soko Mjinga area of Mtongwe in Likoni on Thursday evening fouled the Easter festivities countdown and added swell to rising cases of crimes of passion. By the time the lone gun went silent, Likoni Deputy OCS Joab Omondi and small trader Peninah Kaimeti lay dead, side by side outside the latter’s kiosk.It is an intriguing story laced with tales of love, betrayal and jealousy, one which has left police officers and members of their families as confounded as they are divided. While one account, backed by witnesses, has it that the cop executed the woman before turning the gun on himself, another account talks of a mystery man who sprayed the two with bullets before vanishing in the dark. “We were seated with my sister Peninah, another cousin Jamila and my wife Kanana when the armed officer arrived.The deceased was seated at the middle and he shot her on the forehead before shooting himself too at a distance,” Dennis Kaburu, Peninah’s brother who was at scene said.Kaburu denies that her sister and Omondi were lovers. Instead, he confirmed that her sister was once married to a military officer attached to Mtongwe Navy and they had two children together aged 11 and seven. The two however had separated a few months ago after a dispute.“We have never seen or heard about the killer officer before. They were never together with my sister and this is the first time we are hearing about him,” said a pained Kaburu. Likoni Deputy OCS Joab Omondi who shot himself after killing his girlfriend Peninah Kaimet at Likoni’s Mtongwe area in Mombasa County early on Friday, April 19, 2019. Likoni police boss Benjamin Rotich said Omondi had been the deputy OCS for three months. He said the officer left the station at 7.30pm on Thursday in a jovial mood. Witnesses said he then downed copious amounts of liquor at a local bar. Some accounts say he openly, told anyone in the bar who could listen that he was about to do something terrible.He then whipped out his Ceska G5969 pistol and walked into the darkness, where his victim was seated with her relatives chewing miraa. 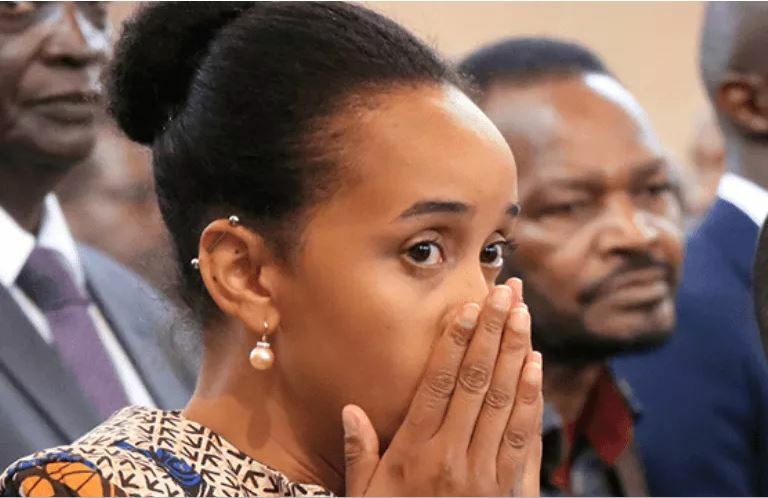 She had barely started to enjoy the few bottles of beer that she had brought from the bar when Omondi arrived, fired one round in the air, ordered the music switched off and turned on Peninah, striking her in the forehead.It is claimed he took another aim at Kaburu but missed target. After a short lull, a crowd gathered and surged towards Omondi, who was still standing over his victim. He then pointed his gun towards his neck and pulled the trigger. He collapsed into the ground after a single shot. In the meantime, Peninah was rushed to Coast General hospital but was declared dead on arrival. A police officer who asked not to be identified, said Omondi had appeared disturbed in recent weeks over something. The officer claimed Omondi and Peninah had a brief affair.Caroline Kanana, her sister-in-law who also witnessed the killing said the officer was after Peninah because he singled her out of a group of four seated outside her shop. “He would have killed us all but he was clearly after Peninah. He removed a small gun from his chest and shot her once in the forehead,” said Kanana.Another man Sammy Itare claimed Omondi had threatened to do something heinous while drinking in the bar.“We heard from his friend that he announced he was going to do something but he did not explain what was it,” said Itare.